Are you looking for a diagnostic tool that can save you money out of the box? 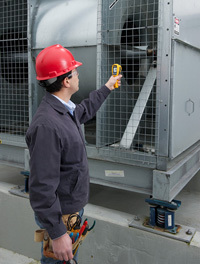 A tool that can help you troubleshoot malfunctioning HVAC mechanical systems? One that is literally a "'point and shoot" device? The Fluke 62 MAX+ Infrared (IR) Thermometer is just that tool! In fact, once you begin to use it you might find it indispensable. It has become the first tool out of my tool bag (I'm a senior HVAC technician and troubleshooter).In just a few weeks of using my Fluke 62 MAX+ IR Thermometer I found a large number of ways it could help me. Here are some of the ways. 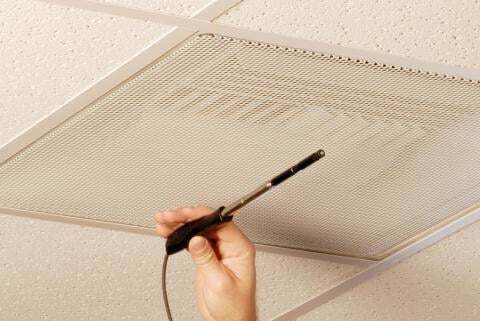 You can check the discharge air temperature of an HVAC unit with a ceiling discharge while standing on the ground. Not only is this safer than using a ladder; the values can be used to adjust the control system and reduce energy waste. Many air handling units produce a 55 °F (12.7 °C) discharge temperature. Occupants often complain about being too hot or cold. You can check the accuracy of the room thermostat very quickly with the Fluke 62 MAX+ IR Thermometer. Then you can make adjustments to the thermostat or replace the thermostat if necessary. Water coils in HVAC systems typically use hot or chilled water. You can quickly check the water temperatures at the inlet and the outlet of the coil with the Fluke 62 MAX+ IR Thermometer. 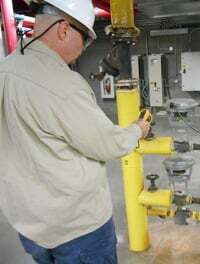 This will indicate proper water temperatures, heat transfer, and valve operation. 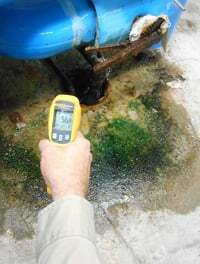 A check can also indicate if there are any water balance problems. 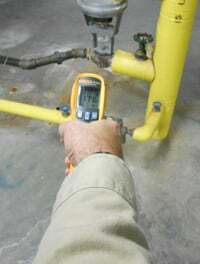 Viewing the temperature of the condensate line from a steam trap, to make sure it is functioning properly. Testing the steam trap to see whether the trap has failed open and is wasting steam. Measuring the steam temperature at the inlet to the humidifier valve. 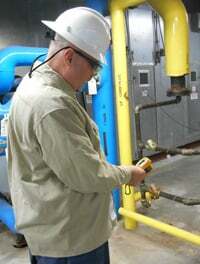 Measuring the water temperature at the inlet to an air handling unit coil. Taking the temperature of condensate from an air handler coil as it goes into the drain. HVAC air handling units are designed with specific coil temperatures. 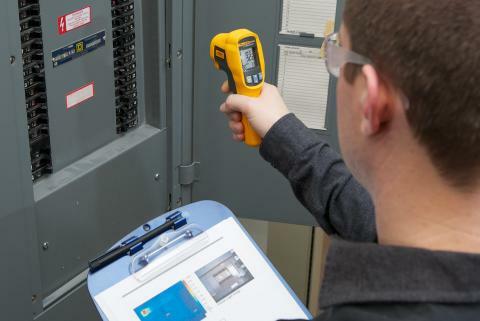 You can use the Fluke 62 MAX+ IR Thermometer to quickly check the coil temperatures. This will reduce energy waste and increase comfort. Many buildings use a hot water heating system. You can check the hot water boiler temperatures easily, quickly, and safely with the Fluke 62 MAX+ IR Thermometer. You can then adjust the water temperature controls to save energy and money. A system that is even a few degrees off over the course of a heating season can result in expensive energy expenditures. Steam trap failure can waste energy and cause improper HVAC system operation, resulting in a system freeze up. 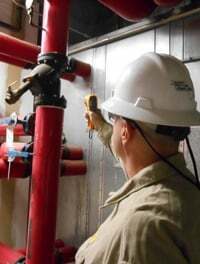 With the Fluke 62 MAX+ IR Thermometer you can quickly identify a steam trap that has failed either open or closed. A room or space may have several air distribution ducts. One or more of them may be shut off. With the Fluke 62 MAX+ IR Thermometer you can identify those discharge ducts that are shut off, by checking the discharge temperatures of the different ducts and noting those that do not show the correct discharge temperature. A large room or area may have hot or cold spots due to system design or installation. With the Fluke 62 MAX+ IR Thermometer you can easily identify these sources of discomfort and complaints. Many HVAC control panels have multiple power supplies. You can use the Fluke 62 MAX+ IR Thermometer to quickly identify the power supply that has failed and is causing improper system operation. Many HVAC systems have a humidifier installed. With the Fluke 62 MAX+ IR Thermometer you can quickly determine if water or steam is present at the humidifier and if it is operating properly. This increases safety because you do not need to touch the humidifier. Many commercial buildings use chilled water to cool the building. The chillers usually provide water at 42 to 44 °F (5.5 to 6.6 °C). Energy will be wasted if the chilled water temperature set point is incorrect. You can use the Fluke 62 MAX+ IR Thermometer to make sure the chilled water temperature provided to the building matches the set point. 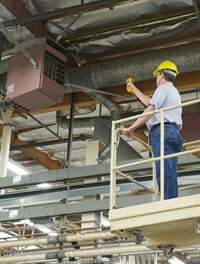 Almost all commercial air handling units provide a low temperature limit switch. To prevent the freeze up of a water coil, the low temperature limit will stop the supply fan. In some cases the low temperature limit may be adjusted incorrectly. You can use the Fluke 62 MAX+ IR Thermometer to check the calibration of the low temperature limit and adjust as needed. A large amount of HVAC equipment is mounted above the floor in hard to reach areas, which can cause a safety hazard. You can use the Fluke 62 MAX+ IR Thermometer to easily check the temperature without exposing yourself to any safety issues. Variable air volume (VAV) systems are the most common type of HVAC system installed today. The VAV terminal boxes control airflow and temperature in the building spaces. Many VAV terminal boxes are located at the perimeter of the building and include hot water reheat coils. These reheat coils have automatic valves. You can use the Fluke 62 MAX+ IR Thermometer to check the discharge air temperature of the VAV box as well as the reheat coil inlet and outlet water temperatures. These temperatures will indicate whether the hot water valve is opening and closing properly. 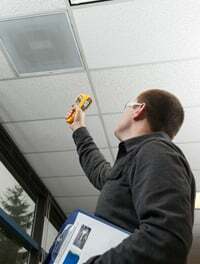 In addition to checking the supply air temperatures of a terminal or air handling unit, it is often necessary to check the temperature of the return air from the room. The Fluke 62 MAX+ IR Thermometer is an ideal instrument to use to check the return air temperature. Many buildings use air handling or terminal units with electric heating elements. These include heat pumps, VAV terminal boxes, and air handling units. If the controls are not functioning properly, a large energy waste can occur which can lead to very high energy bills. You can use the Fluke 62 MAX+ IR Thermometer to check the correct temperature set points of the electric heating coils. Air conditioning and refrigeration compressor failures are a source of very high repair bills. They also cause product loss and system downtime. This can be very expensive. You can use the Fluke 62 MAX+ IR Thermometer to check the compressor temperatures and detect problems before they lead to expensive failures. It is absolutely critical that products in coolers and freezers are maintained at the correct temperature. The Fluke 62 MAX+ IR Thermometer can quickly show that the products in a cooler or freezer are stored under the proper conditions. Since you can point the Fluke 62 MAX+ IR Thermometer at any products in the refrigerated space, it is superior to simple fixed location thermometers. And at the same time you check the product temperatures, you can check the evaporator coil and discharge air temperatures as well. Ice build-up on low temperature coils will reduce equipment efficiency. Defrost systems are provided to melt the ice when needed. If the defrost system operates improperly, the refrigeration system may ice up and fail, which will cause product loss. You can easily check the defrost system operation with the Fluke 62 MAX+ IR Thermometer. Another use of the Fluke 62 MAX+ IR Thermometer is to check the actual coil temperatures of refrigeration system evaporators and condensers. These temperatures indicate proper system operation and efficiency. Improper coil temperatures can help identify problems while they are small and easily correctable. Many possible high-impact uses of the Fluke 62 MAX+ IR Thermometer exist, in addition to the examples given here. Usually when I get to the job site, I just start pointing and using the Fluke 62 MAX+ IR thermometer right away!